Salesforce main revenue generation strategy is based on a subscription-based cloud service. Over 92% of Salesforce revenues come from four categories of cloud CRM (Customer Relationship Management) services, that span from the sales cloud to marketing cloud. The remaining revenues are primarily driven by professional services. In 2017 the company generated $8.39 billion in revenues. Salesforce is a leading provider of enterprise software, delivered through the cloud, with a focus on customer relationship management, or CRM. Salesforce introduced a first CRM solution in 2000. The key to Salesforce value added is based on the fact that service offerings can be deployed rapidly, configured easily and integrated with other platforms and enterprise applications, or apps. While this might seem trivial today, it wasn’t back in the 2000s. CRM services often required high upfront costs together with expensive services hard to run and maintain. Salesforce changed all that. The revenue model Salesforce uses is the subscription-based business model. The strength of the company derives from its sales cloud offerings. Over $7.75 billion came from those services. That represented over 90% of the revenues for 2017. 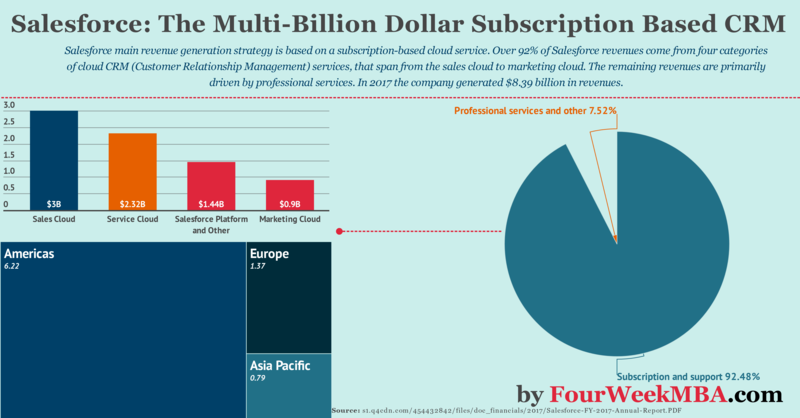 Sales Cloud: it was Salesforce first offering, and it continues to be the largest contributor to total subscription and support revenues. This is a service which enables companies to store data, monitor leads and progress, forecast opportunities, gain insights through relationship intelligence and collaborate around any sale on the desktop and mobile devices. Service Cloud: which is the second largest contributor to total subscription and support revenues. It enables companies to deliver smarter, faster and more personalized customer service and support. Marketing Cloud: This service enables companies to plan, personalize and optimize one-to-one customer interactions across email, mobile, social, web and connected products. Commerce Cloud: it empowers brands to deliver a comprehensive digital commerce experience across web, mobile, social and store. Community Cloud: It enables companies to quickly create and manage trusted, branded digital destinations for customers, partners, and employees. IoT Cloud: it enables companies to harness the power behind billions of connected devices, products, sensors and apps to derive entirely new levels of customer insights. Salesforce Quip: it is a next-generation productivity solution designed for teams with a mobile-first strategy, empowering everyone to collaborate more effectively, work smarter and supercharge their productivity, all without email. Salesforce Platform: (formerly App Cloud) that is for building enterprise apps— powering Salesforce’s CRM apps, with thousands of partner-built apps and millions of custom apps built by customers. Those represented the majority of the company’s revenues in 2017. What distribution strategy does Salesforce tap into? and field sales personnel based in territories close to their customers. Both telephone sales and field sales personnel are supported by sales representatives, who are primarily responsible for generating qualified sales leads. Salesforce has a network of partners who refer sales leads and who then assist in selling to these prospects. In return, Salesforce typically pays these partners a fee based on the first-year subscription revenue generated by the customers to whom they refer. Since 2009, Salesforce has been investing in early-to-late stage technology and professional cloud service companies across the globe to support key business initiatives to extend the capabilities of its platform and CRM offerings. The primary objective is to increase the ecosystem of enterprise cloud companies and partners, accelerating the adoption of cloud technologies and creating the next generation of mobile applications and connected products. Multi-channel marketing campaigns span across email, social, and web. Other marketing activities refer to proprietary events of all sizes, ranging from Dreamforce to salon dinners, as well as participation in trade shows and industry events. Press and industry analyst relations to garner third-party validation and generate positive coverage for Salesforce. Event sponsorships and primary real estate signage. While primary revenues are generated via cloud services. The largest market for Salesforce is America, followed by Europe and the Asia Pacific. Professional services and other revenues represent the remaining of its revenues. Those consist of fees associated with consulting and implementation services and training. Salesforce also offers some training classes on implementing, using and administering service that is billed on a per person, per class basis.